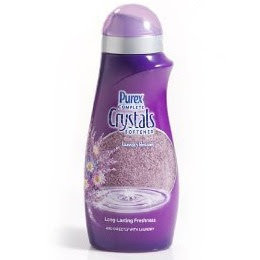 A few weekends ago, my mom gave me some of this Purex Complete Crystals Softener to use, in the lavender scent. I'm a big fan of fabric softener, specifically lavender, and was excited to try this. Trust me, I'm not a popular enough girl in the blog world to have this post sponsored, so this is all me. I'm not super impressed by this. It isn't bad, and I do like that I don't get it on my hands because the bottle doesn't leak like my liquid softener can. However, I still like my Method Detergent and Softener better than this product. I will definitely use it until it is gone, but will probably not buy more...unless it's free.